“We dream the same dreams” –President Theodore Roosevelt, in a letter near the turn of the 20th century to Gifford Pinchot, his confidante and the first chief of the U.S. Forest Service. Beginning on August 10, 2013, when fire was first reported near the Deadwood Ridge area not far from the Western States Trail, this story looked like the ending would be far from happy. Over the next 19 days, a firefighting force that reached more than 1,900 battled a blaze with a footprint of more than 30 square miles, totaling more than 27,000 acres. The ‘American Fire,’ as it would come to be called, would consume several of the most iconic sections of the Western States Trail. The Western States Trail, home to the Western States 100-Mile Endurance Run, had been subjected to arguably its most wildfire-induced insult ever. Unlike the Star Fire of 2001, which scorched more than 11,000 acres and forced the closure of a key section of the race course–Duncan Canyon, for more than four years–the American Fire took with it not only scenery but structures filled with symbolism and history. By the time full containment was reached on August 29, the scenic, blue-sky vistas of the Pucker Point loop near the old mining settlement of Last Chance were marred by blackened trees and smoke’s suffocating scent. That wasn’t all. Three buildings linked to gold processing at the Pacific Slab Mine–the Pacific Slab was the last operating hydraulic mine in California–near the North Fork of the Middle Fork of the American River, had been burned. Heading down into Deadwood Canyon–where thousands of runners over Western States’ 40-year history had learned firsthand why the crucible of the ‘Canyons’ section of the course was so fraught with breathtaking beauty and the ugly potential for ruined races because of blown quads–the Pacific Slab Bridge was lost. A little less than a mile later, the iconic ‘Swinging Bridge,’ always at the ready for a happy combination, as its accompanying sign always indicated, of “5 runners/3 horses” for safe passage across the clear, mountain-fed waters of the North Fork of the Middle Fork of the American River, was ruined, its wooden panels dangling helplessly like darkened, deadened limbs. So much, it appeared, seemed lost. Particularly when planning efforts to rehabilitate the trail stalled shortly after the fire was contained with the shutdown of the federal government, from October 1 to 16. During this 15-day period, federal-government workers, including Forest Service representatives who have been long-term partners with the Western States 100 in the caretaking of the Western States Trail, were furloughed and forbidden to go out about their daily duties. And then something interesting, if not transformational, happened. The Western States Trail refused to be forgotten. It came to life in a way that was surprising even for those who have loved it over the years. What has transpired since August 10, and what promises to transpire on June 28, when the 41st running of the Western States 100 will be held, has led to a remarkable success story. The massive destruction of a fire has brought about renewal, and a groundswell of collaborative commitment for the trail’s future. User groups and management partners have come together in what has been an historic volunteer effort to ensure the Western States Trail’s re-opening in time for the world’s finest ultrarunners to test their mettle on June 28 and 29. “Got a very close look at the new bridge on Saturday. All I can say for sure is that someday in the far future, maybe a few thousand years from now, there will be some geologic event that will cause the north side of Deadwood Canyon to collapse. Maybe an earthquake or some massive mudslide. When that happens, the one thing left in its original spot will be the Pacific Slab Bridge. It ain’t goin’ nowhere.” –Email from former Western States 100 President John Medinger to Western States Board, Memorial Day Weekend, 2014. Why has the Western States Trail risen back from the ashes, in such a relatively short time? It’s an easy answer, really: the power of the Trail’s people. Let me tell you a little bit about the people who have heard the whispers of a Trail beckoning for their help. These people are emblems of hundreds of volunteers who from October on, have stepped forward, and through their own time, toil, and sweat, have labored to bring the Trail back. The effort to rehabilitate the trail has been coordinated by a joint trail team, headed by lead representatives from the two premier endurance events who use the Trail every summer: Mark Falcone from the Western States Endurance Run, and Steve Hallmark from the 100-mile horse ride held every summer, the Tevis Cup. Never will you find two more contrasting personalities. Falcone has finished both the Run and the Ride and has been a board member for both organizations (most currently on the WSER board). At times, he emanates a coiled intensity. I’ve often thought that standing next to Mark is very similar to standing next to an electrical wire, where surges of constant thought, and energy, are palpable. Mark Falcone. All photos Joe McCladdie unless otherwise noted. Mark, or ‘Marko,’ as he is known, is a strategic thinker, with a mind tuned carefully to next steps, to next plans, to next accomplishments. I still have an Excel document dated September 26, 2013, entitled ‘American Fire WSFS rehab priority matrix,’ that with its list of projected projects includes basically all of the structural assessments, water-bar restorations, erosion-prevention work, snag removal, repair of fire line/dozer damage, and the first talk of a small, alternate trail below Swinging Bridge that could lead to a safe fording of the North Fork of the Middle Fork of the American River, all color-coded and ordered with the neatness of an accountant’s sock drawer, that in many ways sums up the efficient flow of Marko’s mind. Before the joint trail team had even been out on the trail, the rehab plan was already formulated; and, in many ways, thanks to Marko’s strategic planning, the battle had already been won. Yet like many deep thinkers, there can be a graceful flow to his actions. Marko is also prone to strong, quickly released emotion. He can talk of the cell-by-cell significances of workday spreadsheets in one breath, and then become so full of feeling he will quickly grab you and hug you for the friendship and support you’ve given him. More than once throughout the past several months, Marko has been moved to declare that the efforts of so many, in such a concerted, unified way, has been nothing but “all goodness” for those involved. Steve Hallmark, trail lead for the Tevis Cup is a strong man, well over six feet tall. He reminds me of the heroes of Larry McMurtry’s great Western novel, Lonesome Dove, a pleasing mix of the personalities of the retired Texas Rangers Woodrow Call and Augustus ‘Gus’ McCrae–humorous yet serious, courageous yet comic with a great sense of humor, strong-willed yet supple enough emotionally to understand the points of view of others. Steve has always been a vital presence at all trail-rehab meetings and in connecting the Run’s wishes with the Ride’s. His cheerful, Texas-style baritone matches his face, which is wide and agreeable, narrowing at the top under a shock of graying hair. Everything about Steve has a revitalizing quality to it, and even his thicket of gray hair has this essence, looking as if it should end up as spring snowmelt somewhere, re-charging groundwater… and, in a very real sense, re-charging the shared commitment two organizations harbor for the Trail they love. Together, Marko and Steve have helped bring the resources and man/womanpower of the Ride and Run together in ways we never could have imagined. Even during the government shutdown, both men were already immersed in developing drafts of work schedules for the coming winter and spring. Once the spring arrived, they were able to rally a record-breaking volunteer turnout. Most years, joint team trail work totals around 1,000 or 2,000 hours. This year, with final preparations still being made by our trail volunteers in the high-country sections of the course, the joint trail team effort has already exceeded more than 6,000 volunteer hours–an all-time record for volunteerism at Western States. The volunteers run the gamut from people such as Charlie Gabri, who has tended the trail for nearly 30 years, often on his own, to Elke Reimer-Truscott, who began volunteering in 2006. Gabri, a retired computer programmer and former Marine whose gray hair is drawn back tightly, like the mane of a stallion, knows the Trail’s idiosyncrasies, its topographic idioms, as well as anyone. For many years the five-time Western States finisher who lives in Foresthill was a trail team of one. A self-described “restless and curious person,” he tended the Trail and immersed himself in its history. “I just found the history so interesting,” he says. “When I first started running the Trail, then working the Trail, I got curious about the Trail’s history, how the different places we went through came to be. I started spending some time going to the library in Auburn and reading all the old documents about the towns and the events that carried on, on the Trail. Gabri knows the number of miners who used to live on the Trail, the number of switchbacks on the tortuous journey up to Devil’s Thumb, the history of the engineering of the mining that took place. “These are the things that make it special,” he says. “He’s the person, maybe more than anyone else, who planted the seed with others about working on the Trail,” Mark Falcone says of Gabri. “Charlie laid the foundation, established all the principles, mentored us so that we work together and we work together for the good of the Trail. Falcone says perhaps the most rewarding part of the past few months has been watching Gabri interact with a group of eight young people who joined the effort in the spring. Thanks to the urging of joint trail team volunteer Bill Rose, the team submitted an application for spring 2014 to AmeriCorps, which, over its 20-year history has engaged young people throughout the country in intensive service each year at nonprofits, schools, public agencies, and community and faith-based groups. The young AmeriCorps volunteers spent more than six weeks working daily on the Trail, and spent much time with the hawk-faced, bearded, ponytailed man who had started Western States trail work on his own more than two decades before. And there are volunteers like Elke Reimer-Truscott. Elke Reimer-Truscott (second from right) and Steve Hallmark (second from left). Photo courtesy of Elke Reimer-Truscott. Elke graduated in the shadow of the Western States 100, from Auburn’s Placer High School (where the race finishes each year) in 1982. She began volunteering for trail work in 2006, encouraged by Western States board member Donn Zea, who, along with 25-time Western States finisher and five-time champion Tim Twietmeyer, has been one of the undeniably driving forces behind the success of the trail team. Elke, already passionate about the outdoors and physical work, originally volunteered because of a desire to spend time on the Trail in order to get to know it better. Of course, it helps that Elke herself is a nurturing person, who has a way, through an innate sense of decency and kindness, of bending people, like fresh twigs, toward their better instincts. The partners from the government, people such as Victor Lyon, District Ranger for the American River Ranger District of Tahoe National Forest, Mary Sullivan, District Recreation Officer, and Mo Tebbe, Public Service Officer, have shown themselves time and again to be the type of empathetic, intelligent, selfless professionals that Pinchot, the founder of the Forest Service, had to have had in mind when the first few graduates of Yale’s Forestry School came out West at the turn of the 20thcentury to serve their country. “I doubt if any other profession can show a membership so uniformly and enthusiastically in love with the work,” Pinchot wrote in 1914 of the special type of person it takes to man a Forest Service post. Victor Lyon, Mo Tebbe, and Mary Sullivan are people who care so much and try so hard that their example imprints itself in the hearts and minds of those who partner with them. And perhaps the most notable Forest Service representative and example of this Pinchotian ethic is a young man named Matt Brownlee. Brownlee is built like a steel canteen–short and sinewy, compact, and deceptively functional–and with a youthful face hidden behind a hedge of a dark beard. He has the muscled hands of a sculptor. Shake hands with him, and you notice immediately Brownlee’s hands feel like sandpaper, rough with callouses and ridges of dry skin that point to his life’s calling. He is a builder of trails and has traveled the West in doing so. But more than that, Brownlee, in his quiet, deliberate, and effective way, knows how to build bridges between people. “The trail building USFS ‘master,’” Reimer-Truscott says, with great affection, of Brownlee. Brownlee, throughout these many months, has shown our trail team and its cadre of volunteers the best practices in becoming master craftsmen in trail building. Water banks have been re-engineered. Rock walls have been rebuilt. Sections that were seared in the heat of fire have been reimagined so that they can more quickly be returned to their original beauty. Brownlee started the process months ago as an outsider, an instructor, a teacher. Like so many others, though, the Trail has gripped him hard, the way it has gripped volunteers such as Reimer-Truscott and Gabri, with its ability to help a person come to a better understanding of our natural world. I can think of no better example of how the Trail’s embrace was felt than what transpired on May 4, when a group of 50 volunteers replaced the scorched skeleton of what had been the Pacific Slab Bridge. Bill Rose, called “a super volunteer” by Falcone for his ingenuity and effort, had basically constructed the new Pacific Slab Bridge in his driveway, with materials purchased by the Run and the Ride, with his own tools. The new bridge was then disassembled, and during the first full weekend of May, driven to Deadwood Canyon in pieces. The 50 or so volunteers who had gathered for that weekend’s work outing then carried the pieces of the new bridge on their backs deep into Deadwood Canyon for nearly a full mile, down a steep trail littered with oak leaves, pine needles, duff and twigs, branches, and treacherous rocks. Then the bridge was assembled again at the site of the burned Pacific Slab Bridge. Its presence took the burned-out gloom of the old structure and replaced it with the pure possibility of something new, its wood rich and smooth, its screws and joints shining like freshly minted silver. Months in the making, with thousands of volunteer hours in the bank, it felt as if an important monument had been erected. The new bridge made the Trail feel whole again. Race Director Craig Thornley, who has come to respect Brownlee a great deal, remembered how the young trail building master became quiet, moved by the emotion of the moment. “It was one of those special days where you feel such a strong sense of pride to be part of such a special community. We helped the Trail on its way back. It’s a day I think we’re all going to remember, because so many people–50 people!–had gathered to work for something that was going to help the entire community of ultrarunners for a long, long time to come. What was interesting about that day was 50 volunteers was just the tip of the iceberg. We could’ve had 100 people down there in Deadwood Canyon that day, easy. “That’s the level of commitment our trail work team has for the Trail. Western States 100 Race Director Craig Thornley (left) and Matt Brownlee. “The great thing about the Trail is it’s not just a Trail. It’s a place that people love. So we have a beautiful Trail, and we have people who care deeply about it. Invariably, these are the people who start spending more and more time on the Trail–running or riding it, exploring it, then branching out to steward it, to work on it, to care for it. So we have this group of people who love the trail and who always want to be out there. There is a lot of history on the Trail, and there also all these people, whose lives pertain to the Trail in real and meaningful ways. That’s why, to me, the Trail will always be a living thing. How can it not be when there are so many people who care about it the way they do?” –Interview with Mark Falcone, May 11, 2014. Many of the runners on the Saturday of the Memorial Weekend Training Run from Robinson Flat are like nervous racehorses, pawing restlessly at their paddock. The minute they are off the school buses that have carefully chugged their way up the winding Foresthill Road to Robinson Flat, they charge up the Western States Trail in full gallop. Such is their impatience to finally get on the Trail. Along with one of my daughters, Katie, I take a slower, more deliberate start. Other than some photos that I’ve received via email, I haven’t experienced the burn areas of the trail in person. I keep thinking about Deadwood Canyon. I dread what I might see. I’ve always loved the slightly less than two-mile, slightly less than 2,000-foot climb from the Swinging Bridge to Devil’s Thumb. While some people might feel the climb can be frustrating, like roller skating up the side of a skyscraper, I’ve relished what it represents: the careful calibration of one’s effort under trying circumstances. If you’re not careful, you become like the person who keeps frantically pumping the gas until your engine floods, or overheats, or explodes. By the time you reach the top of the climb, you hope your legs, your desire, and your sense of personal grace haven’t yet abandoned you. The new Pacific Slab Bridge, halfway down into Deadwood, is, as noted by Elke Reimer-Truscott, beautiful. I’m running near Jim Scott, a 20-time finisher of the race and a good friend of Bill Rose. Jim, in his relaxed voice, his easy stride moving effortlessly down the rock-strewn Trail, marvels at what a craftsman Bill Rose has always been. He says that this particular project, even if it meant that Bill had to use his driveway to design and originally assemble the new bridge, was typical of Bill, typical of the artistry and creativity of an uncommonly gifted builder. “Whoever’s in charge of the race would be a damned fool not to do something like that,” I call to her over my shoulder. After a few minutes of switchbacks, I see the first sign of the clear water of the North Fork of the Middle Fork of the American River. The whole scene as you drop down the final switchbacks, a horizon of rocky sand and water that is clear as crystal, shimmers through strong heat and humidity in an almost hallucinatory way. Swinging Bridge is impassable, its metallic supports laid bare, like open black veins, without their normal covering of wood. Down below, on a newly constructed temporary trail that Mark Falcone’s Western States Joint Trail Team (WSJTT) American Fire Priority List and Risk Mitigation file from September 26 had first suggested, a group of volunteers stand in the waist-deep water of the river. In their hands is a thick safety line, strung from one bank to the other, to ensure the passage of the training run’s runners. I see Peter Defty, whose professional and personal versatility has helped bail the Western States 100 out of a few tight situations over the years. Peter, shirtless and smiling in the bright sunlight, is halfway across the river. I drop into the water and grab the line, helped by the first of several volunteers. When I pass Peter, he jokingly wonders where I’ve been all day. Then I near Chris Thornley, our race director’s brother. Chris is the last of many helpers on the safety line. I’ve never been great in water. Chris, an experienced kayaker who has traveled solo down the Colorado River through the rapids of the Grand Canyon, perhaps senses that I’m clutching the line as if I’m holding on against the tug of death. Chris makes the water immediately seem shallow, less dangerous, by extending his hand and flashing a smile of encouragement, genuinely happy to see me. It seems the kindest of gestures, the type of gesture that great volunteers at Western States like Chris make without even giving it a second thought. My face immediately breaks into a smile. The next day, on the Western States Facebook page, I will see this image captured by the ever-present Joe McCladdie, Western States’ official photographer. Thanks to Chris’s help, I clear the water, stumble up onto the bank, say “Hi” to Craig Thornley and Craig’s wife, Laurie, who are standing near some of the newly cut trail. Then I make my way up the climb to Devil’s Thumb. I’ve finished the Western States 100 10 times over the years. I’ve had many sensations on the climb to Devil’s Thumb. This is the first time I feel my throat tighten from something more than just the effort of a difficult climb. For a moment, as I weave through groups of people, my cadence increasing, their presence dissolves around me. I become lost in thought about the days in August when we first learned of the American Fire. I begin to feel deep emotion grip me. This is not a sad moment, though. It is a happy moment. A trail that had been closed has been re-opened. The fear that something great had been forever lost has dissolved. The labor of hundreds of people has led to this day. Through their effort, the Western States 100 has found something unexpected, and valuable: an affirmation of the community of the trail. It has been a long, hard road to reach where we are at this moment. We have gone from a point so remote on any map of successful possibility that it might’ve seemed foolish to even try to bring the Trail back in time for this year’s Western States. And yet, thanks to hundreds of volunteers and thousands of volunteer hours and an unfailing belief that a Trail could be lifted from the ashes of August, we have. The Western States Joint Trail Team. 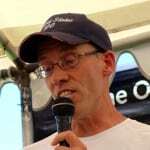 John Trent , a 10-time finisher of the Western States 100-Mile Endurance Run, is president of the Board of Trustees of the Western States Endurance Run. This is a marvelous tribute. Thank you. The trail and the people of the trail hold a special place in my heart as well. Thank you for continuing to preserve the legacy so it's magic can continue to touch others. Thank you for preserving the trail! We need more people like this! He will deflect any praise, but at the heart of this project stands Mark Falcone. When it comes to love for the trail, the inspiration and intelligence to plan what needs to be done, and the sweat and muscle to get it done, Marko stands alone. He is a true American hero. “The secret of endurance isn't so much a lesson as an imperative. .. You take strength in knowing others care about your effort and keep on" kenny Moore.I was reading your piece and I came away with the thought that WSER is truly a gathering place for dream makers of all kinds. A thrilling piece of writing from the heart of the experience itself.